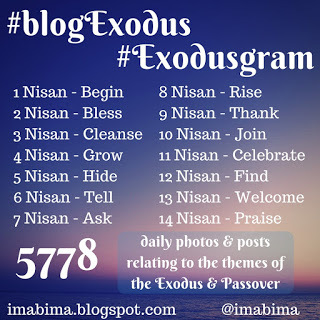 It’s a good thing #BlogExodus has no rules because if it did, I would already have messed up. Moving too fast, multi-tasking, and failing to pay attention, I used the prompt for 2 Nisan for yesterday’s post, and so now I get to begin again. Yay….a do-over! And one with no consequences. Perhaps from this blip on my screen, this imperfection, blemish, failing, shortcoming, defect, deficiency, and blotch, I can learn that it’s normal to make mistakes…and I should stop being so hard on myself when the mistakes are mine. “No worries,” I say to others frequently. “No worries,” I need to begin to say to myself.